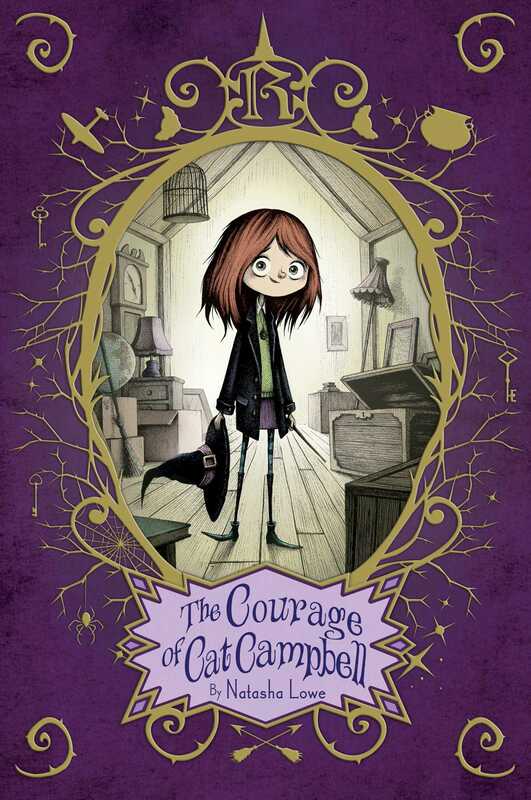 Cat Campbell is a late-blooming witch whose magical abilities have yet to be mastered in this charming coming-of-age story set in the world of The Power of Poppy Pendle. THE FOLLOWING AFTERNOON AT 3:35, Cat Campbell was born on the floor of her mother’s bakery, right into the strong, hairy arms of her father. Tristram had been trying to hustle Poppy, who was clearly in labor, away from the caramel cookies she had been baking and off to the Potts Bottom hospital. But Poppy insisted on getting her last batch of cookies out of the oven first, and so Cat was born on a hot August day, in an even hotter kitchen, greeted by the scent of burning caramel. Her father wrapped Cat up in his none too clean shirt, and she gripped his finger tight in her hand. Staring right at him out of deep green eyes, Cat kicked her spindly legs free. Then, opening her mouth wide, she gave a loud, lusty roar. “Little lion!” Tristram murmured, his fatherly heart bursting with pride. As Cat grew older she loved to sit on the floor of the bakery, which was also the Campbells’ little home, converted from an old, abandoned cottage that sat beside the Potts Bottom Canal. It was a few minutes’ walk from the center of town, but nobody minded the detour because Cat’s mother made the most delicious breads and pastries. Cat would stir imaginary concoctions around in saucepans, banging on their metal sides and chattering away in baby language. 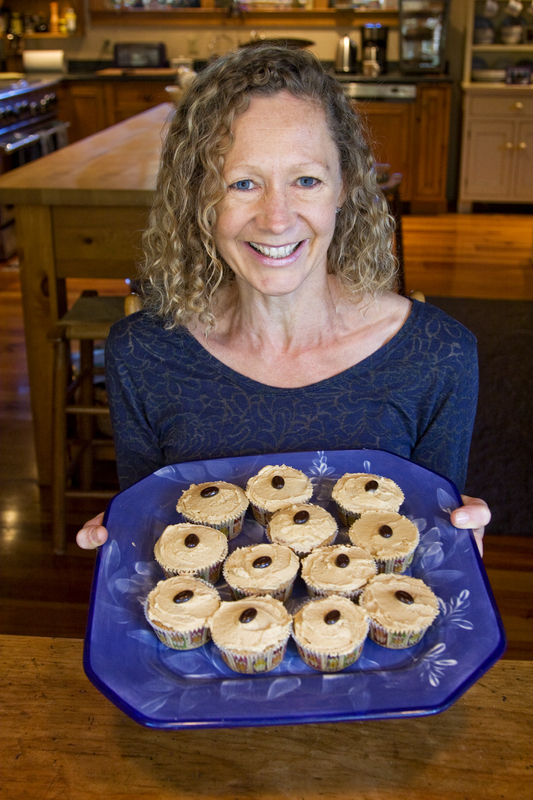 When she was two, Tristram made his daughter a wooden stool so she could stand at the counter mixing up her own special recipes beside her mother and Marie Claire, the elderly Frenchwoman who owned the bakery along with Poppy. Cat liked to raid the spice shelf, shaking cinnamon, ginger, and chili powder into her bowl. She’d open all her mother’s canisters, spooning in cornmeal and brown sugar. Anything Cat could wrap her tiny hands around she’d use. One time a ladybug flew onto the table and Cat scooped him up before he could escape, dropping him into her batter. “Insect cake! Yummy,” Cat’s dad said, watching Cat stir it around with her spoon. “Ibeldy gobble,” Cat shrieked, jumping up and down and waving the spoon over the bowl. “A great baker, just like her mother!” Tristram commented. And Poppy couldn’t help smiling because Cat did seem so happy in the kitchen, even though her experiments always ended up getting poured down the sink. Cat shook her head, sprinkling pepper and cloves into her bowl. “How about a chocolate cake?” Marie Claire suggested. “No,” Cat replied, plopping in a spoonful of cocoa. “Like an airplane?” Poppy said, a touch nervously. “Uh-uh.” Cat shook her head. “Like a witch, Mamma. I want to be a witch.” Cat grabbed the kitchen broom and smeared the sticky potion all over it, and then, with the broom between her legs, she jumped off her little stool. “Mine,” Cat cried out, pointing at the broomstick. “It is not yours,” Poppy replied with rather more force than was necessary. Cat’s little face started to crumple, unused to hearing her mother sound so sharp. “Why don’t you help me make cookies?” Poppy suggested more gently. “No.” Cat shook her head. “No,” she said again, dipping the spoon handle into her bowl of homemade potion. She lifted it out and held it up for Poppy to see. “I fly on this then,” Cat declared, straddling the wooden spoon. Crossing her fingers under the table, Poppy made a silent plea. Please, please, please, don’t let my daughter be magic, she begged. Poppy knew that if a child was going to inherit the magic gene, it usually showed up around four or five years old, so there was plenty of time yet. But although Cat spent every spare minute she had leaping off chairs with her arms outstretched, and mixing up pretend potions, she didn’t, much to her mother’s relief, show any real signs of magic. “I don’t want to talk about this,” Poppy said, turning away from the window. As the years passed by, Cat’s passion for magic grew, even though it became clear that she hadn’t inherited the magic gene. It was so unfair, Cat thought as she blew out her birthday candles year after year. Her mother was, or had been, a witch long ago—a pretty good one too, according to her grandparents. And yet she had given it all up to become a baker. A baker! How boring was that? Standing in a hot kitchen all day, spending hours and hours making things that would disappear in a couple of bites. What a waste of time, when you could buy a perfectly good cake from Super Savers Market. And how wonderful it must have been to be magical. Her grandmother often told her how they had first discovered Poppy had the gift of magic—how when she was a baby she had blown beautiful multicolored bubbles and how, just by waving her baby fists around, wonderful iced cakes would appear. Cat sometimes tried blowing bubbles in front of the mirror, but try as she might, all she managed to produce was a colorless bit of drool down her chin. That’s what Cat thought so unfair—her mother had the gift and didn’t appreciate it at all, while she, Cat, who really, really wanted it, couldn’t even manage a magical dribble. “Why on earth doesn’t Mum just use magic?” Cat would sometimes ask her father, when the bakery had been particularly busy and Cat’s mother was exhausted from a day spent baking batch after batch of delicious cakes and cookies. “Take a look at The Compendium of Witchcraft Cookery sometime, Cat,” her father would reply with a grin. “You don’t want to know what goes into those cookie spells. They say they always use all natural ingredients, but really . . . a smear of snail’s slime, a wisp of worm’s wind. . . . Let’s be thankful Mum likes to do it the hard way. Nothing beats butter.” And he’d take another large mouthful of caramel crunch cookie. “I’d use magic all the time if I had the gift,” Cat would say wistfully, waving a wooden spoon around the kitchen. “Abracazam!” she’d cry out, but nothing ever happened. Most days, after school, Cat loved to watch the Ruthersfield girls come swooping along the canal path on their broomsticks, propping them outside the bakery as casually as if they were umbrellas. They’d swan through the door in their smart purple uniforms, magic wands sticking out of their backpacks. Ruthersfield Academy was the only accredited school for magic in the country, and it was right in the center of Potts Bottom. Cat would have traded her last bag of jelly beans to go there. She’d hear the girls groan about spell tests and potions class as they bought bags of sticky buns, and the longing inside Cat would grow so intense it became almost a physical ache. She had tried talking to her mother about Ruthersfield, about what it was like when she had gone there, but Poppy refused to discuss it at all. “Magic made me miserable, Cat.” That was all she would say. “I hated Ruthersfield,” Poppy would snap with such force that Cat always let the conversation drop. One day, unable to help herself, Cat climbed onto a smooth chestnut broomstick leaning against the side of the bakery. The teacher it belonged to came every week to buy a loaf of her mother’s walnut bread. She didn’t look much older than some of the year-twelve girls, with her bouncy brown curls and smooth skin, but instead of a uniform she dressed in the long purple gown the teachers wore. “Fly,” Cat ordered the broomstick, jumping off the ground. She imagined how it would feel, soaring through the air, and Cat jumped again and again, but each time she landed with a thud. “Do you think I might have my broomstick back, please?” the woman said, coming out of the shop, a bag of warm bread in her arms. “Well, don’t give up yet,” Clara Bell said, tucking the bread into her satchel. “I was ten when I showed my first sign of magic. A Late Bloomer,” she added with a smile. But by the time Cat turned eleven, it was clear she had not inherited her mother’s magical gene, although every time she blew out her birthday candles or saw a shooting star, that was the wish Cat made. “Thanks, Dad,” Cat replied, unable to quite give up on her dream. Her mother was relieved. Cat knew that. Poppy couldn’t hide her feelings toward magic, although she hated seeing her daughter so sad. “We’ll find you a passion you can do,” Poppy suggested, buying Cat ice skates, a paint set, and a tennis racket. She signed her daughter up for gymnastics classes, horseback riding, and rock climbing. But although Cat had fun and enjoyed trying new things, nothing could take away her desire to be a witch. The one thing in the world she couldn’t have.